hari ni nak buat personality test sikit. kadang-kadang nak faham diri sendiri pun rasa macam complicated kan? pernah tak you guys rasa macam korang ni ada split personality? is it me at school is just a pretending me? 4) read your personality analysis! 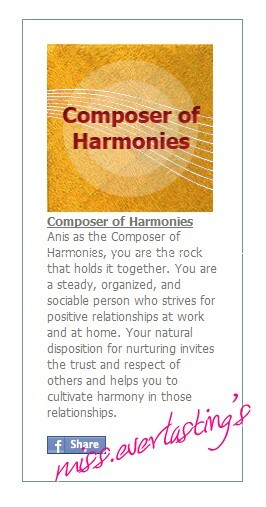 Anis, as the "Composer of Harmonies", you are the rock that holds it together. You are a steady, organized, and sociable (true!) person who strives for positive relationships (lagi true!) at work and at home. People are often impressed and comforted by your warm, empathetic nature and understanding (haha, sangat true, bangga kejap ^^). You tend to look for the good in others and situations, avoiding negative interactions (sumpah betul. selalunya, kalau orang macam cakap buruk2 pasal orang lain, i will be like, "yeke? takde lah, korang salah paham je kot" or "dia ada masalah kot" haha, baik kan i? :p) whenever possible. You consistently demonstrate precision and accuracy (yea yea..i am miss perfectionist) , paying close attention to your actions. With a talent for creating order, you typically display a high level of quality in your work and can focus until your goal is accomplished (hurm, ni pun betul. kalau i say i wana do something, i'll do it to the end). Although others may view you as reserved (betul kalau around org yang tak kenal), you likely come alive in personal, low-pressure situations where you can feel truly connected to and acknowledged by those around you ( ni pun betul, sebab i akan hyper dengan org yang i selesa je..huahua). You will go out of your way for your friends and often find yourself in roles of service. Others experience you as stable, accepting, and even-tempered, putting them at ease in your presence. You are neighborly, generally open-minded and able to see the 'best' in others. Once you form a bond with another person, you have no problem talking about personal subjects and extending trust. You are likely a good listener (well, even though i ckp banyak, but you can tell me anything! i will listen ^^) and a stable friend, doing quality work and diligently nourishing your relationships. -You likely avoid conflict (ye, tak suka gado-gado nihh), which may prevent you from setting appropriate boundaries and expressing your own needs and wants. If you don't express your own needs, you may feel resentment. At times, you may need to make a concerted effort to stand your ground. -You will take your time to gather all the information to make decisions. If you are unable to gather this information, you may struggle with decision-making (angguk-angguk). At times, you may have to push yourself to be more spontaneous or go with your "gut" instincts. hurrmm..so how bout you guys? kalau dah rasa seronok, cuba lah try yang ni. or this one.